Information about the early history of the Ganslandt's are hard to find. Most of the old church chronicles were lost during the Thirty Years War. The documents left were collected and given to the Lübeck City Archive, where they unfortunately were burned in a bomb raid during World War II. In Heiligenhaus near Wülfrath, a location named Ganslandt is mentioned in 1434. 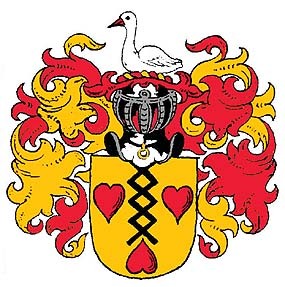 There is a little river named "Gansbach" (goose creek) and a settlement place named "opp dem Ganselande" (on the goose meadow), where the three Ganslandt manors (Groß-Ganslandt, Klein-Ganslandt and Ganslandt-Siepen) were located. Pictures of Groß-Ganslandt and Klein-Ganslandt in 1978. Today, only Klein-Ganslandt still exists. The family must have gotten its name from the location, but there are no documented Ganslandt's from that time. The earliest documented family member is Tileman Gantzland, who went to Halle/Saale from his home-town Ratingen in 1604. There are two fragments of a saxonian familiy-line from that time. At the moment, there is no connection with the main family line, which starts with Johann Ganslandt. He is mentioned as a member of the society of sword makers and as a senator of Solingen in 1660/1661. His son Wilhelm was born in 1638 and in 1679 was mayor of Solingen. He had a son, also named Wilhelm (born in 1697), who was a merchant in Solingen and Lübeck and is the father of Röttger Ganslandt. 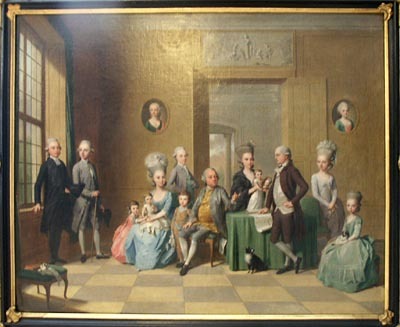 Picture of Esaie Souchay (sitting in the middle) and his family by Anton Wilhelm Tischbein (1779). Esaie Souchay's grandson Röttger Ganslandt is standing at his knee. The son of Röttger Ganslandt, also called Röttger married Jeanne Guillaumine Souchay. For the family Souchay, there exists a printed family chronicle (Otto Döhner: Das Hugenottengeschlecht Souchay de la Duboissière und seine Nachkommen. Deutsches Familienarchiv Band 19, Neustadt 1961), so that the genealogy of the Ganslandt family is documented very well from then on until 1961, where the chronicle stops. I have added more recent data about the few Ganslandt's still living in Germany. Any information about family members living in Sweden or other countries would be helpful to complete this site and update the Souchay Chronicle.